Are you wondering what fence to choose? That can be a highly loaded question because every property chooses to fence for different reasons. As a Professional Minnesota Fencing Company in the Twin Cities, we can help you narrow down which fencing would work best for your application. At any time, you can feel free to call us for a free estimate on your desired fencing project at (763) 755-0088. There are many more reasons, share yours in the comments below! Wood Fence – Wood fencing offers a variety of options. This fence type is sturdy, provides a nice, natural look and patterns can be easily customized to ensure privacy or maintain views. Because this fencing is made of wood it is important to choose a solid wood species and make sure it is stained – to prevent rot. Staining or painting is recommended every two years, which is more maintenance than the rest of the listed fencing types. Vinyl Fence – Vinyl fencing, although commonly more expensive than wood, requires little to no maintenance work. No painting or staining is needed, just a hose off now and again. Color options are almost limitless and vinyl can be customized to be private or open. One thing to consider about vinyl fencing is that not all vinyl is created equal. It is important that the contractor you work with provides a quality vinyl fencing product. Chain Link Fence – A very common options for homes, parks, and many other locations is chain link fence. 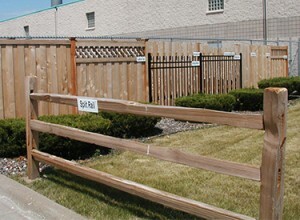 This fencing type is secure enough to keep most dogs safely in the yard (unless you have escape artists that digs). Usually this is the most affordable fencing type. Chain link fencing comes in many colors to complement your home or space nicely and requires little to no maintenance. It can also be customized with different posts, filled in for a higher amount of privacy and added support can help keep bigger, more excited dogs from making their own exit. Ornamental Fence – The most expensive option would have to be a steel or aluminum ornamental fencing. This fencing type is more than just an added perimeter, it is added excellence. 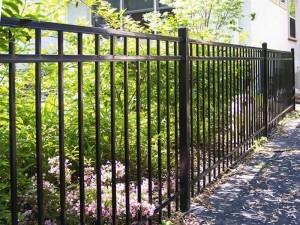 Ornamental fencing lasts and lasts and the picket styles are numerous. 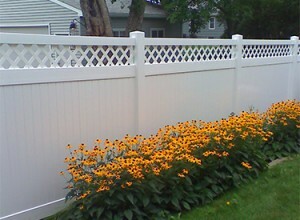 This high-end fencing does a great job at looking good and being low maintenance. Colors are slightly customizable and the beauty is undeniable. Talk about adding value to your property! Still need help choosing a fence? We hope we helped you narrow down your options for choosing the perfect fence for your property. Contact Arrow Fence Co if you are searching for the right fence and fence installation company in the Twin Cities, MN today at (763)755-0088.